Zion Market Research has published a new report titled “Sorbitol Production Equipment Market by Type (Hydrogenation Reactors, Evaporators, Ion Exchangers, Sedimentation & Filtration Tanks, and Others): Global Industry Perspective, Comprehensive Analysis, and Forecast, 2018–2025”. According to the report, the global sorbitol production equipment market was valued at approximately USD 200 million in 2018 and is expected to generate around USD 350 million by 2025, at a CAGR of around 6.8% between 2019 and 2025. The high demand for sorbitol production equipment is mainly due to the need for sorbitol production. Sorbitol is mainly used in the food and beverage industry as an artificial sweetener in food products. Generally, starch is used as a raw material for sorbitol production. Starch crops grain or roots are the basic raw materials. The basic raw materials, such as starch, are cleaned first and then extracted in a wet milling process. This is followed by purification of glucose, which is extracted from starch. The glucose is then turned into its aqueous form. The impurity present in the solution is cleaned via ion exchangers. After ion exchange, the solution is sent to hydrogenation reactors where hydrogen is added to convert the whole solution turns into sorbitol. The evaporators and filtration tanks are used to further remove the additional impurities that are present in sorbitol. The production process of sorbitol is known as the catalytic glucose hydrogenation process, which is also the most common process for sorbitol production. 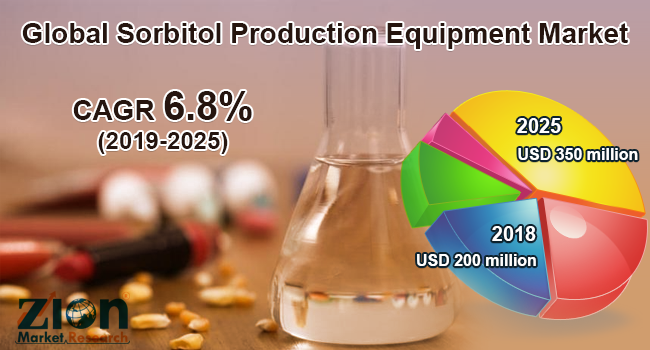 However, the high installation costs of the sorbitol production equipment may hamper the sorbitol production equipment market growth on a global scale in the future. Based on the type, the global sorbitol production equipment market is segmented into hydrogenation reactors, evaporators, ion exchangers, sedimentation and filtration tanks, and others. Hydrogenation reactors are expected to dominate the sorbitol production equipment market globally over the estimated timeframe. Sorbitol is mainly obtained from the catalytic hydrogenation of glucose, which involves extensive use of hydrogenation reactors. Some key players of the global sorbitol production equipment market are Beijing MecKey Engineering Co., Bosida Machinery, Mukul Engineering Works, Dipesh Engineering Works, Sri Ram Engineering & Fabrication Works, Ilshin Autoclave Co. Ltd., AdEdge Water Technologies, LLC, DSSE, Universal Process Engineers, and Raj Process Equipment and Systems Pvt. Ltd., among others.